Velvety chocolate ganache and freshly zested orange hidden under a rich dark chocolate crust, hand-made from fresh ingredients in our London kitchen. 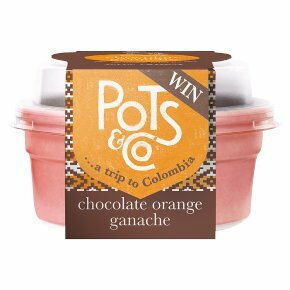 Pots & Co is dedicated to producing exceptional food in beautiful ceramic pots that travel from fridge/freezer to oven to table with ease. We use the best quality ingredients and all our products are 100% natural, preservative-free. It all started when our chef Julian who has worked with many of Britain’s best-loved Michelin-starred chefs started thinking... whenever he cooked, he always used the right dish to get perfect results. He knew that perfect heat distribution makes a Sticky Toffee Pudding perfectly gooey, a soufflé perfectly light... Then he had an idea. What if he made beautiful restaurant quality desserts each served in its own very special ramekin, perfect to cook in, perfect to go on the table (no mess turning out a hot pudding!). Then you get to keep the ramekin to re-use again and again. Pots & Co was born! Julian set about creating these recipes with Adam his trusted right-hand man, each recipe a British classic in its own right made with a passion and flair usually reserved for restaurants. The end result? Perfect puddings every time. Great as a treat, perfect for easy entertaining (you don’t have to tell them we made it!). Mix and match with the rest of our range: Lemon & Lime Posset, Sticky Toffee Pudding and Caramelised Apple Crumble. Handmade. In pots we bake. Slow & simple wins the race. Gluten free. Nothing artificial. Suitable for vegetarians. Our pots aren't just pretty Baking our puds in their pots gives them their signature depth and intense creaminess, while naturally doubling their fridge life.